The homes in Daniel�s Orchard, ranging from just over 1,500 square feet to nearly 4,000 square feet, feature a wide range of extras, including wideplank hardwood floors throughout the main living areas, free-standing claw foot bathtubs, crown molding, Colonial style trim and lush courtyards. A hundred years later, still reeling from the effects of the Civil War, the debilitating earthquake of 1886 and a fire that left much of the heart of Summerville in ashes, the small town northwest of Charleston received an economic boost from an unlikely source. Citing the alleged healing power of the pine tree�s scent, the International Congress of Physicians in Paris dubbed Summerville one of the best places in the world for people to be treated for and recover from lung disorders. A spike in tourism and in the permanent population of Summerville soon followed. �The Flower Town in the Pines� has thrived through the good times and survived through the bad to remain a small but vibrant people friendly town, proud of its past but ever looking to the future. 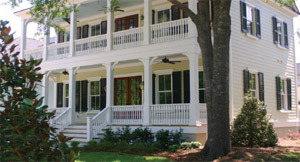 Hundreds of thousands of people visit the town, many of them during Summerville�s renowned Flowertown Festival, walking its tree-lined streets and admiring the beauty of its timeless architecture. With more than 700 listings on the National Register of Historic Places, Summerville�s homes and businesses offer an uncommon glimpse of Southern history. And just a short distance from downtown, the developer of a new and growing neighborhood has captured that rare blend of past, present and future that has attracted people to Summerville and its environs for more than two centuries. When completed, Daniel�s Orchard will be a community of 155 singlefamily homes and 60 town homes, along with five parks and a top-of-the-line amenities center, all located on approximately 70 acres on Highway 78, just a half mile from downtown Summerville. Sintra Development Corp., which designed the community based on the town�s existing architecture, took great pains to remain true to history. Sintra gave Allison Ramsey Architects two years to study every aspect of Summerville�s historic homes and commercial buildings. The result is an upscale neighborhood offering 27 distinct single-family home plans and five town home options in a setting reminiscent of Summerville�s past. The homes in Daniel�s Orchard, ranging from just over 1,500 square feet to nearly 4,000 square feet, feature a wide range of extras, including wideplank hardwood floors throughout the main living areas, free-standing claw foot bathtubs, crown molding, Colonial style trim and lush courtyards. Homeowners have a choice of other custom options with cabinetry, lighting and interior paint. Gas lanterns, open porches, elevated foundations and spacious floor plans recall the days when Summerville served as the summer home for wealthy South Carolina planters. Inside, Sintra has copied a page out of history, building homes that adhere to the strict standards of the artisans of centuries past, their work still standing today, a testament to their skills and dedication to perfection. Outside, Sintra has established a similar connection to Summerville�s past. With sidewalks on both sides of the streets and five easily accessible parks, residents will have ample opportunity to visit with their neighbors, attend community functions or simply relax and enjoy South Carolina�s pleasant weather. And, of course, Daniel�s Orchard will feature azaleas, the centerpiece of Summerville�s annual Flowertown Festival, throughout the community. Residents of Daniel�s Orchard also will be able to reap the benefits of a first-class lineup of amenities, including a clubhouse; a swimming pool; a covered pavilion, patio and grilling area; a playground; an events lawn; a gazebo; and five parks, the largest of which will span the length of an entire block of homes. Home prices in Daniel’s Orchard range from the upper $200,000s to the low $500,000s. For more information, visit www.DanielsOrchard.com or call (843) 879-0955.